As you might’ve guessed from the title, it’s been over 30° for at least three days now, and it’s not going to cool down in the foreseeable future. The Bureau of Meteorology is predicting MINIMUMS of 24°. Yuck. I’m going slowly batty and getting mighty tempted to pull a Caligula and try and battle the sky into submission. Only, Caligula tried it with the sea. So I guess this is the ideal opportunity to get all show-and-tell with some of my previous successes/blunders. Let me just get my teeth-whistly old-person voice on. I’ve been sewing since year 7, when I joined the Sewing Club at my (then American) middle-school (I know, let’s hear it for the ol’ U S of A, right? ), and demonstrated an absolute lack of affinity for it, in much the same way that jellyfish lack an affinity for carpentry. I persisted in dribs and drabs through high-school, making a grand total of three draw-string costume skirts for Fiddler on the Roof, one hideous crushed-velvet elf-dress that I don’t think I ever took off between the ages of fourteen and sixteen, and one appallingly historically-inaccurate *aghem* “Tudor” gown. Come university I renewed my interest, only to find my Grandma tried to do everything for me. To be fair, I did actually make some clothes that saw public wear, including a rather charming little rough cotton babydoll dress that I wore to my 18th, a black cotton version of the much-maligned “Infinity” dress that I wore to my graduation, and a black linen sheath dress that I had to alter the pattern so much for it to fit me that I almost ran out of fabric. And it still wasn’t a great fit. Thanks a bunch, Burda. Realising that as an ultra-petite-long-waisted-pear the commercial pattern industry wasn’t going to offer me much, I turned my back on them and went to the dark side. …only to find that the first draft of my dress block (which, as the book advised, wasn’t completely unrelated to the Table of Average Measurements) had about 4″ extra room in the bust. But now that it’s been corrected (and now that my dress block looks more like a group of bacon rashers than a dress pattern), I can do the whole draft-my-own-dress thing. To be fair I’m still not a crash-hot seamstress. It’s not a skill that’s come easily to me. You’ll see what I mean in a minute. I picked up the yellow fabric at an op-shop in Newstead in the form of a round tablecloth. It STINKS of mothballs once ironed, and as a result of some very sloppy adjustment on the fly due to the small-ish nature of the tablecloth, it’s quite obviously wonky. Doesn’t look so bad with a black belt, but I’d be embarrassed to be seen out in it by anyone who knows anything about sewing. Don’t get me wrong here, the print is awesome and it’s a super-comfy dress with pockets that work, and I’m rather proud of my even topstitching. But the pattern is frump-tastic and doesn’t flatter me. My über short legs make many skirt lengths look strange and frumpy, but don’t agree with my brain, which likes the whole sensible-can-ride-a-bike-without-flashing-too-many-people-in length. Unfortunately I think I just need to bite the bullet and alter it. And the pattern-match at the sides is atrocious. 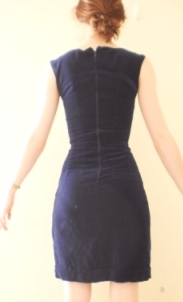 There was only 1.2m of 90cm wide blue velvet that I fished out of Grandma’s stash, and some madness possessed me to make a dress. Due to a rather substantial measurement error, I had to re-make the whole front of the bodice and I thought I was going to die, because there was no fabric to do a re-cut, and it meant that all of my beautifully-matched darts got pulled all skew-whiff. 😡 GRRR. But yet it still works. It could still be improved on (a lot), but I’m not too ashamed to wear it out in public as it is, my strange-looking figure notwithstanding. Bear in mind it looks much better with fancy stockings, red lippy and an elaborate ’50s/’60s updo. Look at them matched bands! Win Win Win! It’s wonky. It’s badly-finished. It’s badly-drafted. BUT YET IT WORKS??? It’s comfy AND relatively stylish in a grungy uni-student sort of way? Whatsmore, I wear it all the time? I still can’t believe it myself. 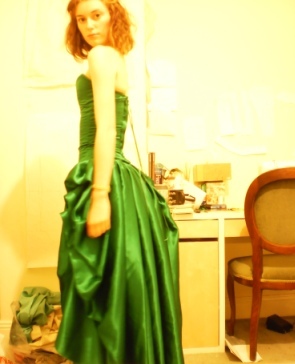 Like every other girl who saw Atonement, I wanted that dress. 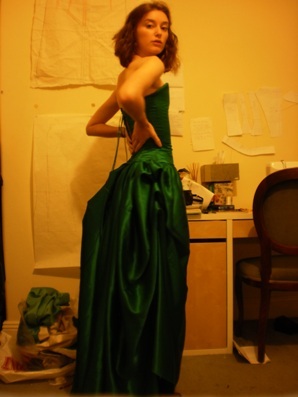 But I’d never made a gown before, and I didn’t know what working with silk would be like. 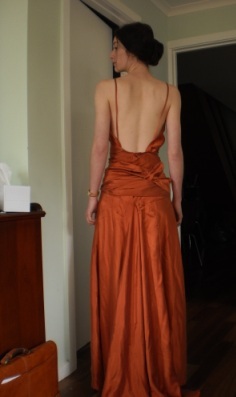 So I researched the hell out of it, made a toile and then did a test run in just under 4m of apallingly stained and narrow-bolted bargain-bin silk satin from *shudder* Lincraft. 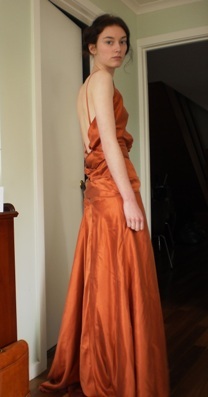 It was only ever meant to be a working toile, (and if I made it again I know what I’d fix), but it looks good from on stage (which is all you need for a performance gown), and the experience was great. Cutting one’s own pattern on the bias on not enough fabric while trying to avoid the stains and then being able to wear the result? Hell yeah! Ignore my anaemic-looking face. I’d had the flu for about 3 weeks at that point. And yes, I know it’s orange. Turns out I like it in orange, as I like most things in orange. But next time I’d get a silk-cotton blend from Cleggs and avoid the whole stains saga. I am so pleased with this thing in so many ways. It’s a good pattern, the finishing is all nice (French seams on the sides, flat-felled at the panel edges, self-bias-binding everywhere else), and I love wearing it. The only problem is the black silk was so tightly-woven that my machine didn’t like it much and there was a lot of hand-wheel action to avoid snapping another needle. So worth it though. I’m wearing it now. It’s wrinkly in the photo because I wear it so much. It’s not the top that’s wonky there, it’s me. Excuse my camera. It likes to change exposures without telling me. Due to the flexy nature of the cableties, it’s still quite comfy to sing in, though it doesn’t change my shape much. Mind you, being made of solid bone, I’m not sure I could expect anything to have changed my shape much. I still have some issues with the back closures that I need to fix (mostly that the skirt waistband ended up too big. Maybe I should just have sewn it straight to the bodice? But I didn’t like the idea of the extra strain on it. Now I’m thinking waist-ties.) So far it’s the best I’ve done. Maybe I’ll get down to some hand-sewing to fix it this evening. Beats turning on the sewing machine.